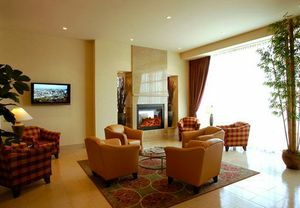 MONTREAL, QC--(Marketwired - Mar 24, 2014) - The most exciting live poker tournament is about to get underway and the Residence Inn Montreal Airport hotel is the place to stay for the duration. The PokerStars Canada Cup at Playground Poker Club is taking place over 13 days, from May 16th through May 28th, and this extended-stay Montreal-area airport hotel has all the comforts of home -- and more. Whether you're a high roller or a spectator, this hotel near the Montreal airport is the perfect place to base yourself and your family during the tournament. There's plenty to keep the whole family occupied, including a nearby shopping mall and full-service spa and, of course, all the attractions of Montreal itself are just a short distance away. With services that range from an onsite restaurant and lounge, a grocery shopping service, and room service, not to mention a daily complimentary breakfast buffet and an evening social on select days of the week, dining will never be a hassle at the Residence Inn Montreal Airport hotel. In addition, every room has a fully equipped kitchen with a refrigerator, dishwasher, microwave, cookware, and tableware for maximum convenience. With an indoor pool and a 24-hour gym, there's no need to forego your workout and the whirlpool is perfect post-exercise or for relaxing at any time. Guestrooms at the Residence Inn Montreal Airport combine comfort and functionality but if you're looking to get out and about, all the excitement of Montreal is just short distance away. Guests coming from out of town will appreciate the complimentary airport shuttle, available on request. This Montreal-area airport hotel is conveniently located for business and leisure travelers, with a free airport shuttle and overnight parking. Knowledgeable staff and comfortable guest rooms will make your visit easy and enjoyable. All rooms have luxurious bedding, custom duvets, and comfortable pillows, and each has a TV with cable channels and pay-per-view programming, as well as a fully equipped kitchen, and a coffee maker with tea service. All have ample room for relaxation or work. Hotel amenities include a business center, and an indoor pool, whirlpool, and fitness center. From Monday to Friday, the YUL Restaurant & Bar is open for breakfast, lunch, and dinner, serving fine French cuisine, and the YUL Bar Lounge is also an option for dinner and drinks in the evening. Complimentary Wi-Fi is available throughout the hotel, in the lobby, public areas, and guest rooms. The entire hotel is nonsmoking. Nearby attractions for the whole family include La Ronde amusement park, the Cosmodome Space Science Center, and the Montreal Planetarium, as well as Montreal's fabulous restaurants, vibrant nightlife, and chic boutiques, all of which make the Residence Inn Montreal Airport hotel ideal for family vacations, business meetings or just a relaxing getaway. The most exciting live poker tournament is about to get underway and the Residence Inn Montreal Airport hotel is the place to stay for the duration. The PokerStars Canada Cup at Playground Poker Club is taking place over 13 days, from May 16th through May 28th, and this extended-stay Montreal-area airport hotel has all the comforts of home -- and more.